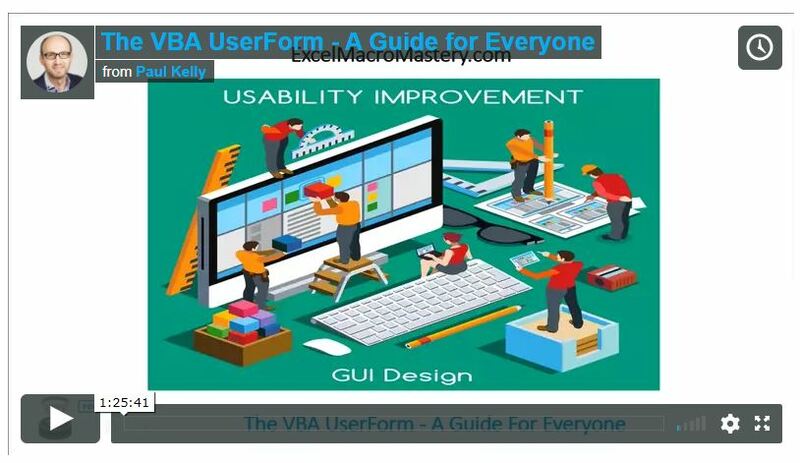 5 What are VBA Userforms? Get\set the title form.Caption = "Car Details"
If you are a member of the website, click on the image below to view the webinar for this post. The VBA UserForm is a very useful tool. It provides a practical way for your application to get information from the user. If you are new to UserForms you may be overwhelmed by the amount of information about them. As with most topics in VBA, 90% of the time you will only need 10% of the functionality. In these two blog posts(part 2 is here) I will show you how to quickly and easily add a UserForm to your application. 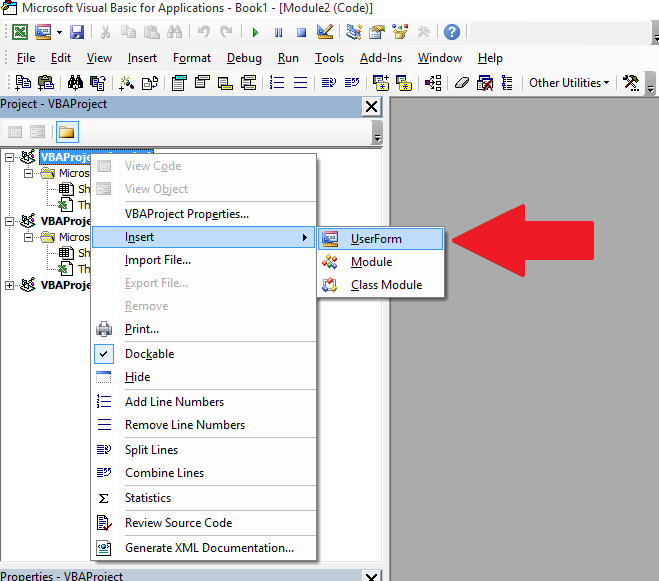 This first post covers creating the VBA Userform and using it as modal or modeless. I will also show you how to easily pass the users selection back to the calling procedure. 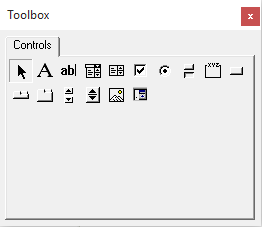 In the second part of this post I will cover the main controls such as the ListBox, the ComboBox(also called the Dropdown menu), the TextBox and the CheckBox. This post will contain a ton of examples showing how to use each of these controls. A UserForm is a dialog which allows your application to get input from the user. 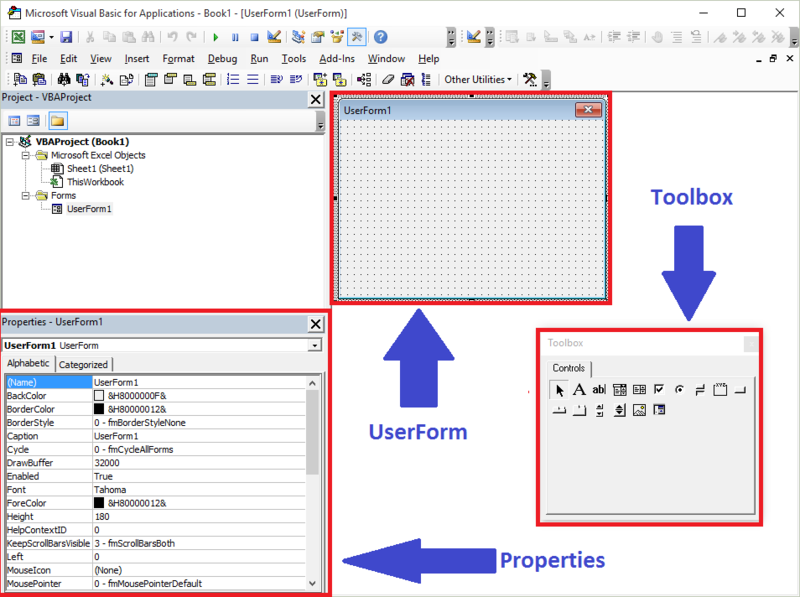 UserForms are used throughout all Windows applications. 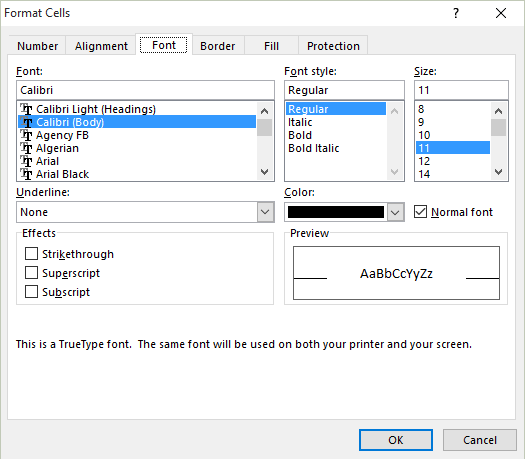 Excel itself has a large number of UserForms such as the Format Cells UserForm shown in the screenshot below. UserForms contain different types of controls such as Buttons, ListBoxes, ComboBoxes(Dropdown lists), CheckBoxes and TextBoxes. There are other controls but these are the ones you will use most of the time. It is important to note that VBA has some useful built-in UserForms. These can be very useful and may save you having to create a custom one. Let’s start by having a look at the MsgBox. 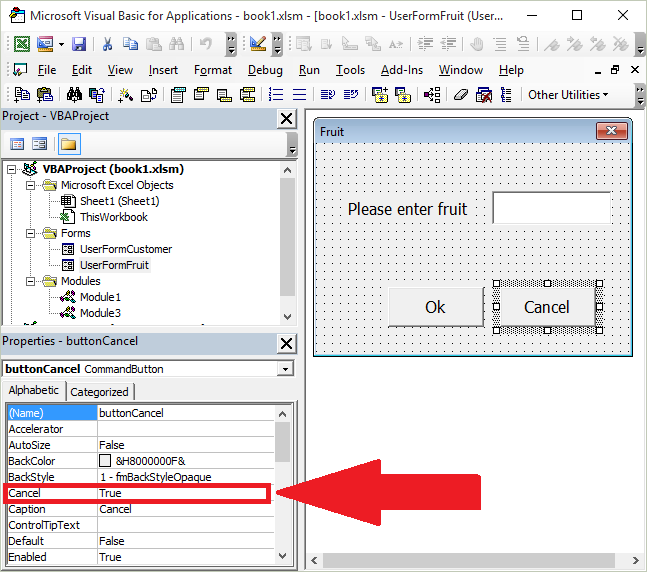 The VBA message box allows you to display a dialog to the user. 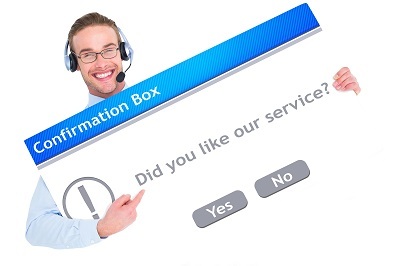 You can choose from a collection of buttons such as Yes, No, Ok and Cancel. You can easily find out which of these buttons the user clicked on and use the results in your code. MsgBox "There is no data on this worksheet "
MsgBox "There is no data on this worksheet ", , "Error"
Debug.Print "The user clicked Yes"
Debug.Print "The user clicked No"
Debug.Print "The user clicked Cancel"
We can use the Windows file dialog to allow the user to select a file or multiple files. Note: If you need more flexibility then you can use the File Dialog. This allows you to use the “Save as” file dialog, select folders and so on. If the built-in UserForms do not cover your needs then you will need to create your own custom Userform. To use a UserForm in our code we must first create one. We then add the necessary controls to this Userform. A newly created UserForm will appear. Anytime you want to access this Userform you can double click on the UserForm name in the Project window. The Toolbox dialog should also be visible. If it’s not visible select View->Toolbox from the menu. We use the toolbox too add controls to our UserForm. To view the design of the UserForm, double click on it in the Project window. There are three important windows we use when creating our UserForms. Let’s have a look at a very simple user form example. The UserForm will be displayed – you have created your first UserForm application! We can change the attributes of the UserForm using the properties window. Select View->Properties Window if the window is not visible. When we click on the UserForm or a control on a UserForm then the Properties window displays the attributes of that item. Generally speaking, you only use a few of these properties. The important ones for the UserForm are Name and Caption. Note: If you double click on a control it will bring you to the click event of that control. This can be a quicker way to get to the UserForm code. When we use a UserForm we are dealing with events. What this means is that we want to perform actions when events occur. 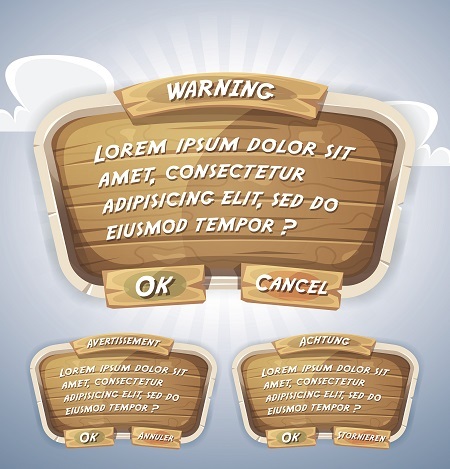 An event occurs when the users clicks a button, changes text, selects an item in a ComboBox etc. We add a Sub for a particular event and place our code in it. When the event occurs our code will run. One common event is the Initialize event which occurs when the UserForm is created at run time. We normally use this event to fill our controls with any necessary data. We will look at this event in the section below. To add an event we use the ComboBoxes over the code window(see screenshot above). The left one is used to select the control and the right one is used to select the event. When we select the event it will automatically add this sub to our UserForm module. Note: Clicking on any control on the UserForm will create the click event for that control. The first thing we want to do with a UserForm is to fill the controls with values. For example, if we have a list of countries for the user to select from we could use this. To do this we use the Initialize event. This is a sub that runs when the UserForm is created(see next section for more info). Right click on the UserForm and select View Code from the menu. In the Dropdown list on the left above the main Window, select UserForm. This will create the UserForm_Click event. You can ignore this. In the Dropdown list on the right above the main Window, select Initialize. Optional: Delete the UserForm_Click sub created in step 2. Once we have the Initialize event created we can use it to add the starting values to our controls. We will see more about this in the second part of this post. The UserForm also has an Activate event. It is important to understand the difference between this and the Initialize event. We normally reference the UserForm first by calling Show which makes it seem that displaying the UserForm is triggering the Initialize event. This is why there is often confusion over this event. In the example below calling Show is the first time we use the UserForm. Therefore it is created at this time and the Initialize event is triggered. The Activate event occurs when the UserForm is displayed. This can happen using Show. It also occurs any time the UserForm is displayed. For example, if we switch to a different window and then switch back to the UserForm then the Activate event will be triggered. Initialize occurs when the Userform is created. Activate occurs when the UserForm is displayed. For each UserForm you use – Initialize occurs only once, Activate occurs one or more times. Modal means the user cannot interact with the parent application while this is visible. The excel Format cells dialog we looked at earlier is a modal UserForm. 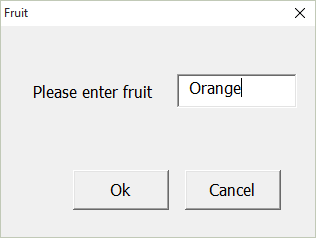 So are the Excel Colors and Name Manager dialogs. We use modal when we don’t want the user to interact with any other part of the application until they are finished with the UserForm. Modeless means the user can interact with other parts of the application while they are visible. An example of modeless forms in Excel is the Find dialog(Ctrl + F). You may notice that any Excel dialog that allows the user to select a range has a limited type of Modeless – the user can select a range of cells but cannot do much else. As the comments in the above indicate the code behaves differently for Modal and Modeless. For the former it waits for the UserForm to close and for the latter it continues on. With a Modal UserForm we normally have an Ok and a Cancel button. The Ok button normally closes the UserForm and performs the main action. This could be saving the user inputs or passing them back to the procedure. The Cancel button normally closes the UserForm and cancels any action that may have taken place. Any changes the user made on the UserForm are ignored. With a Modeless UserForm we normally have a close button and an action button e.g. the Find button on the Excel Find Dialog. When the action button is clicked an action takes place but the dialog remains open. The Close button is used to close the dialog. It normally doesn’t do anything else. We are going to create a Modal UserForm example. It is very simple so you can see clearly how to use a UserForm. 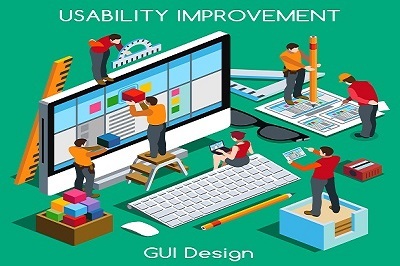 What you will notice is that we hide the UserForm when the user clicks Ok. We don’t set it to Nothing or unload it until after we are finished retrieving the user input. If we Unload the UserForm when the user clicks Ok then it no longers exists so we cannot access the values we want. We always want to give the user the option to cancel the UserForm. Once it is cancelled we want to ignore any selections the user made. Each form comes with an X in the top right-hand corner which allows the user to cancel it. To avoid this error we want to prevent the UserForm being Unloaded when the X button is clicked. To do this we use the QueryClose event. In the first line we prevent the UserForm being unloaded. With the next lines we hide the UserForm and set the m_Cancelled variable to true. We will use this variable later to check if the UserForm was cancelled. MsgBox "The UserForm was cancelled." If we want to add a Cancel button it is simple to do. All we need to do is Hide the form and set the variable m_Cancelled to true. This is the same as we did in the QueryClose Event above. If you want to allow the user to cancel using the Esc it is simple(but not obvious) to do. You set the Cancel property of your ‘Cancel’ button to True. When Esc is pressed the click event of your Cancel button will be used. You can use this code as a framework for most of your Modal UserForms. We are now going to use a simple example to show how to use a Modeless form. 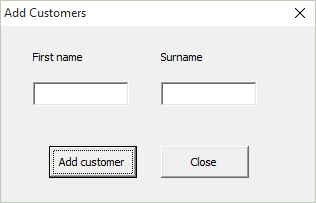 In this example we will add a customer name to a worksheet each time the clicks on the Add Customer button. The following code displays the UserForm. The important thing to notice here is that after the frm.Show line, the code will continue on. This is different to Modal where the code waits at this line for the UserForm to be closed or hidden. When the Add button is clicked the action occurs immediately. We add the customer name to a new row in our worksheet. We can add as many names as we like. The UserForm will remain visible until we click close. You can find the second part of this post here. 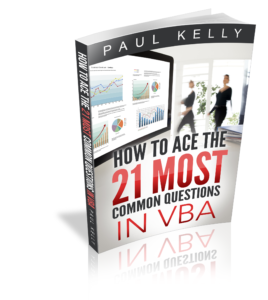 Please feel free to subscribe to my newsletter and get exclusive VBA content that you cannot find here on the blog, as well as free access to my eBook, How to Ace the 21 Most Common Questions in VBA which is full of examples you can use in your own code. No, they will have the same name. So using IsUserFormLoaded won’t check for the second one correctly. IsUserFormLoaded2 = s <> ""
As usual, a very clear and informative entry. I have recently designed a couple of “applications” for my employer in Excel VBA & based on those experiences, I have a humble suggestion for a topic to consider covering in part 2. I had a challenging time scouring the various Excel sites for info on how to use the info on a form if the user can make multiple choices; for example, once the user checks the desired boxes in a multi-select checkbox/listbox, how do I get those items and write them to a range? I did eventually find code to help me do this, and it’s working well, but I can’t honestly say I fully understand HOW it works. Also, I’m writing the values to a range in order to have other subs then loop through the range & use the values for other operations, and I keep thinking that this is actually slowing the application down overall. Excel already has the results in memory somewhere & there’s undoubtedly a way to set them up (maybe as a collection?) and use them for other functions without taking the time to actually write them first, but how? If you have room left in part 2, I’m sure many readers would benefit from your insight in this area. Thanks again for your willingness to help! Thanks very much for the feedback Michael, it is very welcome. I will definitely be including multi-select from listboxes in part 2 of this post. Thanks for this clear approach on userforms. Whats new for me is the declaration of the userform. Its like the declaration of a Class. Does this mean that the way you define a userform, it can be approached like a class? New to me is also the way you use the Property Get in the userform. Does this mean that you can use the value of – let say – a textbox everywhere in the project? I was allways wondering how controls like textbox, listbox, … could be passed to an other sub. I’ve never seen this before and I’m also 15 years using VBA to make things easier and faster than manually. I’ll have still a lot to learn if i read your article. looking forward to see the next chapter on userforms. Unfortunately there’s no Intellisense value popping up to guide us to the right value. Thanks for your comment and the feedback. 1. Yes, when you use an instance of a class in your code it is referred to as an object. So UserForm, Workbooks, worksheets etc. are all objects that have a class defined for them. 2. You can use the value of the textbox everywhere. When the UserForm is closed you would normally store it to a variable. 3. True/False is fine to use for the checkbox. Hi Paul. This is a great site and I really appreciate your willingness to help others. 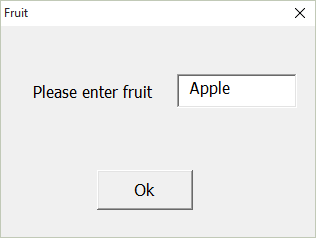 In the modal form I wanted to set a default value for the fruit (say banana) and then have it highlighted so the user could accept it or just start typing. How would you go about accomplishing that? 1. Click on the Textbox and see the value in the Property Window(normally on the bottom left) to your default text. 2. Select View->Tab Order and move the Textbox to the top so it will be the selected control. 3, Add the code below to the UserForm_Initialize() event. I moved the code that highlights the textbox value to the ‘Let’ sub and it works, but seems a bit inelegant and not really the correct place for it. Maybe you’ll be covering this in the next installment? Thanks again for your help. You can put the code in the Activate event instead of the Initialize event. The difference is that Initialize is used when the actual instance is created. So in your example when the Let event is used. The Activate event occurs when the UserForm becomes the active window. On pasting the above code, and running the macro. 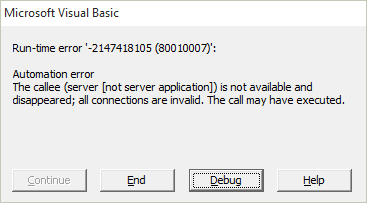 A compile error “Invalid Outside Procedure” pops up. I’m new to vba can you please help? Paul, how do I return the cursor to the first entry box after I hit the “enter data” command button? How do I open a Custom Excel Form that I designed to a specific record. Are you referring to Access VBA or Excel VBA? If Excel, then what control are you using to display the records? very, very interesting and detailed article. Below vba update same cell. but only 3 rows can update .i have 16 rows ca you fix. This is great stuff. Honestly, can’t thank Google enough for having me stumble upon your website. I am recently starting to learn VBA in order to create a supplier form for our company. We have several suppliers and many invoices in a given month, so I decided to come up with an easier way to register invoices linked to the respective supplier and then connect this with the various methods of payments we have. I have already sketched out how I would like this to work out and the UserForms. I am really good with excel formulas and can handle it really well, but when it comes to VBA, I have no knowledge of the codes. As a result, the current format I have on my Excel is something only I can use, as others are not able to understand the complexity of my Excel system. 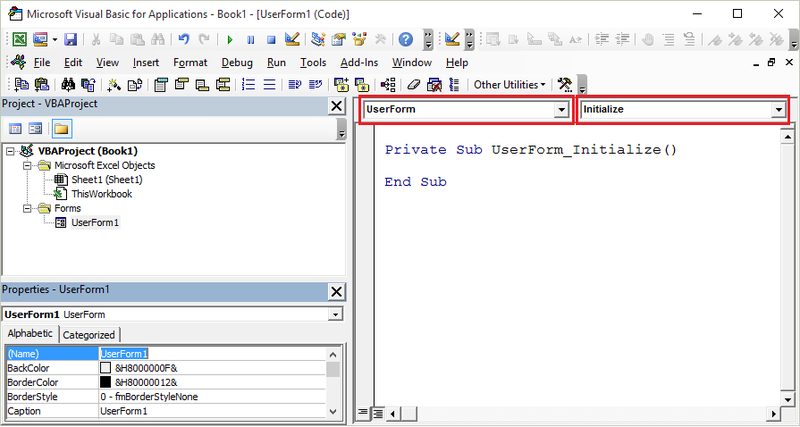 Thus, i am creating one using VBA for everyone to use and not just me – making things much simpler. My main question here is if there is a way to automatically fill a set of TextBoxes on the UserForms. 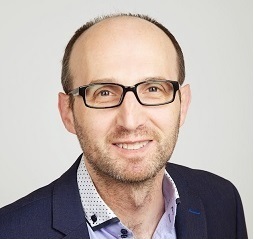 For instance, after having registered the supplier and its details regarding bank details as step one, I want the user to be able to select the supplier whos invoice he/she is entering in the userform, and automatically fill in the other details of the textboxes, such as bank details – then allowing them the option of agreeing with the bank details and if the user wants to change the details given a change on the invoice. I hope I am clear enough on what I am looking for, and if you could please help me get started with this new project I am working on. You can put the suppliers in a ComboBox and allow the user to select from this box. Then you can use the Change event of the combobox to file the textboxes based on the current supplier. Awesome, Paul. The sharing is very informative. Even as I am a newbie, this given me a lot of information. Thanks for this guide. It’s very detailed and well explained. I would like to change the number of the button with a variable, but I don’t know how to do it. I’m not clear on what you are trying to do. Can you explain what you mean by “change the number of the button with a variable”. Is there a particular reason you use variant data type for the form properties rather than a boolean or string? They should be boolean and String. I have updated the post. Paul, thanks so much for the information. I want to call other sub procedures from within the UserForm on startup, but I dont know whether that should be in the Initialize or Activate procedure. In either case, when I step through the code with F8, it does not update the date label or step to the subprocedures to prefill the text boxes with user goals that they may have entered for current day on a prior day. Initialize is when the UserForm is first created. Activate is used everytime the Userform is shown. So if you hide the userform and then show it again this will run. Put a breakpoint(F9) on the first line of the sub and see if it stops here. I’m new to userforms and your article is a great starting point. Like all your posts. Thank you so much. Hi Paul, I am using Excel VBA. 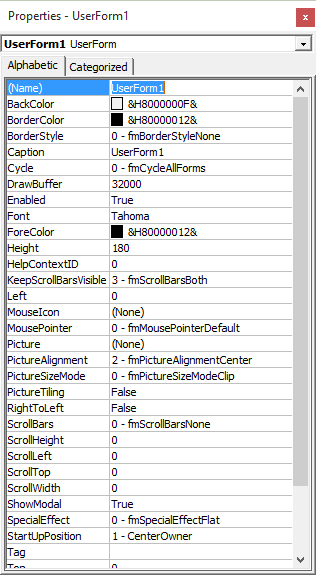 Is there a way to make the caption font in a UserForm bold and (say) size 14? I have looked around, but cannot find an obvious solution. (By the way, the website is great)! There is no simple way to do it. You need to use a Windows API. This is a good discussion about it. Very useful explanation of some of the details of a userform. I have a question about control of a userform that might be a combination of modal and modeless. In an automated process, a (separate) main userform takes information and automatically opens, finds, populates and prints a worksheet. That now works well, incorporating some of your advice. Adding the ability to loop through the process repeatedly is now something I’m adding. The complication is that there are times when manual modification of entered information before printing is desirable. 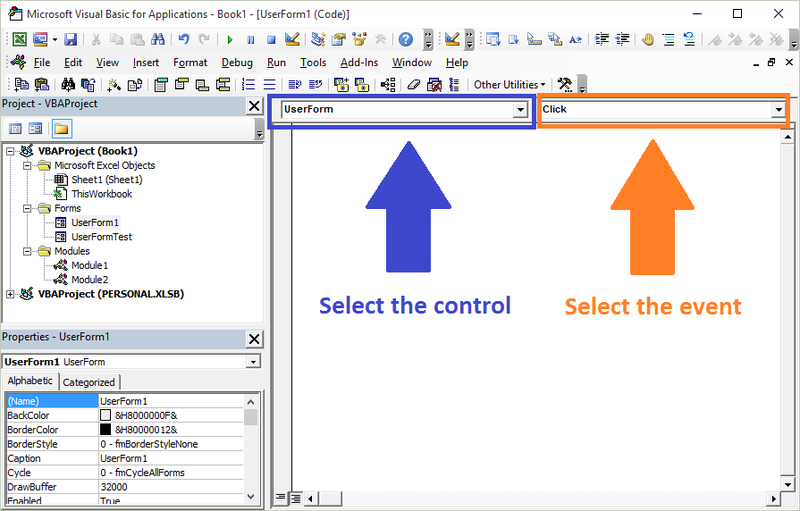 After all the user-selections /-limited-modification-info are entered in a main userform, a second, simple userform is shown to control re-starting the loop. When the populating-and-printing process is performed automatically, the user chooses to start the loop again with the simple userform, so showing the userform modal works correctly — the code waits until a choice is made. However, with manual modification (an option selected by the user in the main userform, so it’s known before the worksheet is opened), I would like the same simple userform to be shown, for the code to wait until a selection is made AND still allow the user to interact with the worksheet. Modal would cause the code to wait, however the user can’t interact with the worksheet. Modeless won’t pause the code but does allow interaction. Is there a method to combine the behaviour of the two?